These are used to lift and move pallets and are ideal storage aids for manual tasks over short distances. They are robust, durable, and economical, they offer quiet operation and safe maneuvering. Annapurna Trollies is a manufacturer and exporter of various types of material handling equipments and systems. 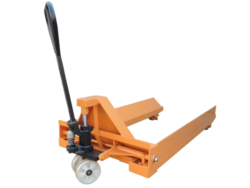 With the help of our expert team members, we have been able to provide Pallet Jack. We are manufacturer and supplier of Pallet Truck o We are offering a quality range of Electric Pallet Trucks to the esteemed customers. Our range of pallet trucks is made available in different models, capacities and other specifications to cater to varied clients' requirements. 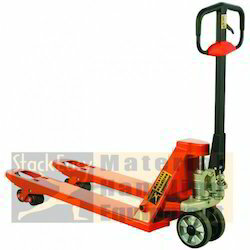 A pallet jack, also known as a pallet truck, pallet pump, pump truck, dog, or jigger is a tool used to lift and move pallets. Pallet Jacks are the most basic form of forklift and are intended to move heavy or light pallets within a warehouse. We are an organization engaged in providing Hydraulic Hand Pallet Truck, which are precision engineered by qualified engineers so as to give maximum efficiency. The machine is easy to install and the programmable electricity control makes it safe for the user. Our products can be availed by our clients in customized range.